Directions: From Morehead, go west on KY 32 (Flemingsburg Rd.) 4.65 miles past the I-64 interchange, then left 1.6 miles on Rt. 158 (Sharkey Road). Go left 0.6 mile on Caudill Cemetery Rd. then right on long private driveway past the house to the barn at the end. 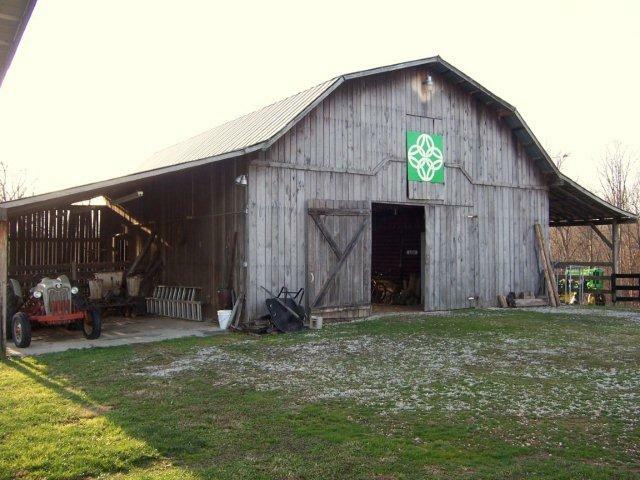 Notes: The Celtic Knot, a 4 x 4 foot quilt block, adorns the barn on the farm of Molly & Leon Smothers on Caudill Cemetery Road. The barn is a horse barn designed and built by previous farm owner Dion Williams in l988. Molly Smothers, minister of the First Christian Church (Disciples of Christ), recently completed her fifth anniversary at the church. Molly is of Irish heritage. Her maternal grandparents migrated from Kilkenny, Ireland to America around the turn of the century (1903-1904). 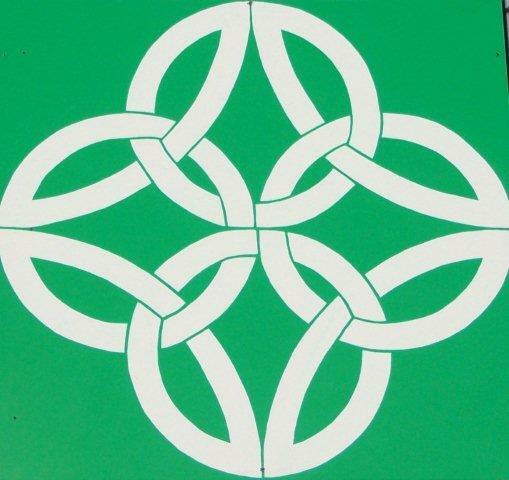 Molly chose the Celtic Knot and the bright Irish green and white colors to honor her Celtic spirituality and the Scotish-Irish roots of her church. Members of her congregation gifted her with the quilt block at a Pastor Appreciation Ceremony in October, 2009. Her husband Leon installed the block.